NEW BUILDING ACQUIRED TO MOVE BOOKSHOP RIGHT NEXT TO MASJID! 1. The new acquired buildings were a former Lloyds pharmacy that were used by the doctors surgery (which has now become Masjid As-Sunnah). 2. We have agreed to rent the buildings with the view to purchase it. 3. Our primary aim is to convert one of the buildings into a bookshop. So we will be moving the bookshop from our current location in Bradford 8 to Bradford 7. 4. 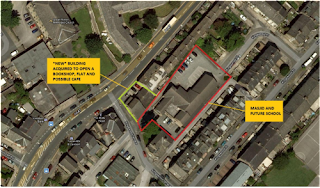 The overall building is quite large so we intend to create a flat upstairs and setup a second business with the sole aim to provide financial support to the Masjid, as explained in our social enterprise model. 5. The pharmacy building is front facing and situated on the main road (Great Horton Road) which boasts a large array of some of the very best food outlets in the city, if not the country (Mumtaz and Anums to name a few). There is a large volume of traffic passing by this main road, arguably, one of the busiest roads in Bradford. 6. Our goal was to centralise operations so the bookshop, masjid and future school are in one location. Alhamdulillah we have achieved this. 7. The long term aim is to purchase this building and make it a means to finance the umbrella project which is the Masjid and then the School. A reminder again that the financial situation of the Masjid is concerning to say the least. The above is to provide you with the confidence that we are striving to become self-sufficing. But at the same time we are in urgent need of donations for the Masjid as our income is substantially less than our costs. Not a penny of your donations will be used for other than the Masjid. We ask you to donate for the sake of Allaah, in particular as the month of charity and generosity fast approaches.